Since I manage a very large BP community, I was in a need of a plugin which reduces the data recorded in the bp_activity table, which stores all the Buddypress activity. A plugin that would “block” an activity record from being saved to the stream/database. Activities like user joining groups, friendships and profile updates. But the only plugin which does this was BuddyPress Block Activity Stream Types which was great, but is hasn’t been updated in over 2 years and so isn’t compatible with BP 2.x. So, based on the ideas and footsteps of this plugin creators I made an updated version for Buddypress 2.x. 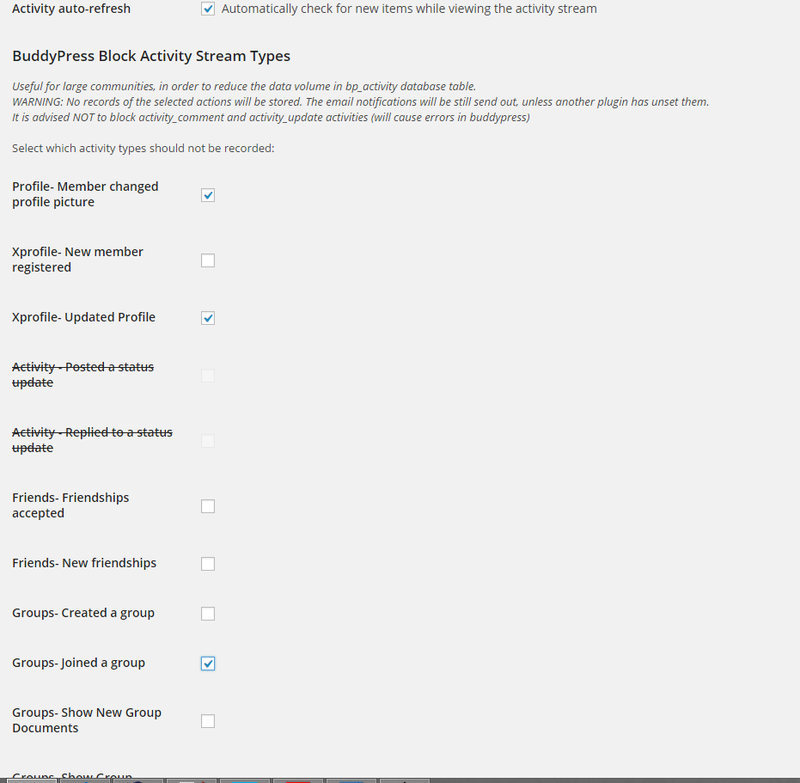 :-), which uses the Settings API of wordpress and adds a “Buddypress Block Activity Stream Types” section into Buddypress Settings admin page. Goood. It’s exactely what I was looking for a few days ago. Thanks for coding! Use this with caution, try it in a dev server first. Hello @LENASTERG! Really appreciate your efforts for developing this plugin. It can very helpful, but its not working on buddypress 2.1.1. After “Select which activity types should not be recorded:” I get the save button, no values to select. Can we fix that? Hi Vic. I updated the code in Github, please downloaded and try again. Useful for large communities, in order to reduce the data volume in bp_activity database table. WARNING: No records of the selected actions will be stored. The email notifications will be still send out, unless another plugin has unset them. Not check boxes or anything. I updated the code again at github. Please downloaded agin activated again. Didn’t check the plugin’s code but maybe this will help to make it better. Hi. Can you send me the error you received by the plugin? First off, thank you for taking the time to share your updated version of this plugin. I just installed BuddyPress on my local site & plan to run it on my live site as soon as I have it configured to my liking, This plugin is exactly what I was looking for. My coding skills are very limited. My question is this: Which file or files should I upload to my plugins folder? I assume that I don’t need the screenshot or readme file but not sure about the others. Do they all need to go under one folder with a title like “buddypress-block-activity-stream-types”? Any instructions would be greatly appreciated. Thanks.